I have worked with Oracle Forms for almost 18 years now. When you are associated with something for so long, it kind of becomes a part of you. You almost start owning it. You can sense, predict and prophecy its reaction, just like an oracle. You probably even start knowing its pros and cons better than its creators, solely because you work with it day-in and day-out. So here's a list of some of the best and worst aspects of Oracle forms that I have encountered so far.I will list the pros first. I have segregated the pros from the perspective of a user and a developer. Triggers at every level; item, record, block, form. Crashing due to connectivity issues (You could try this, just toggle your wifi and see it in action) and you loose all the unsaved data and have to start over again from login screen. Requires Java on the client devices i.e. no iPads or iPhones. Outdated GUI. Not as contemporary as HTML5, CSS3. Connectivity issues with networks of lower bandwidth e.g. DSL. Finding resources with good D2K skill set is not so easy. I am certain some of you reading this may question, why not simply migrate from this ancient (20 years ought to be categorised as ancient in the technology lexicon) old form application to a more modern and open web application. First of all, the very thought of converting Oracle Forms to something else as-is is wrong..The entire task is an expensive time-consuming futile effort. It probably is as good as using your black and white camera for capturing videos without even upgrading it! Most of the transactional forms are heavy and designed with 20 year old technology. So it is better to leave them alone for as long as they work. In cases you absolutely want to redo the Oracle forms, it is advisable to plan a proper migration (no short-cuts) to leverage the latest and greatest technology, that can probably be maintained for another 20 years. However when you have worked on something for almost two decades you really can't let it go nor can you risk your business by continuing with it. So we found better way. 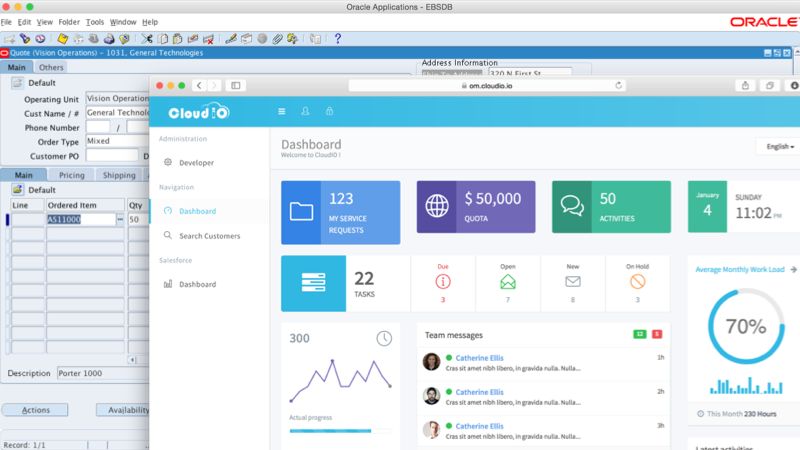 They say, "Be the change you want to see", so we at CloudIO built one! We built the change we wanted to see and developed an application platform that would eliminate the woes of migrating Oracle Forms! Ability to use the keyboard heads down. Ability to Bookmark any page with the data. Allows you to share the URL with your colleagues and they can get right into the same page and view the same data as long as they have access to both the data & the page.